From horizontal stretch wrapper machine, you will get protected during transportation ,after effectively unitizing the pallet by stretch wrapped.And we have listed the adavantages for you as below. 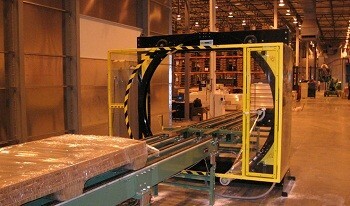 PLC and program makes the machine able to do automatic wrapping according to your packing goal. Photocell sensor is adopted for setting the packing position. The separate control panel makes operation & maintenance easily. The Spiral Orbital Wrapper is designed and modified for straight products. We even extended the range of its usage and made it can be suitable for all profiled materials and pipes. Aluminum packing, rod packing and even panel packing, no matter which industry you are, there is always a role for our machine to play. The machine can bring you with a high efficiency and low cost. Fhope owns few manufacturing sites, but for better management and quality control, your machine will only be designed and produced in one site. Our rich experience and solid reputation have given us the authority in the industry. We have the scientific knowledge of wrapping due to our constant study. And we show a great capability in dealing with all the turnkey project. For instance, stacking, conveying, wrapping and strapping. We keep on updating ourselves into a higher standard.